To geologists, rock is a coherent, naturally occurring solid, consisting of an aggregate of minerals or, less commonly, of glass. Let’s take this deﬁnition apart to see what its components mean. Coherent: A rock holds together, and thus must be broken to be separated into pieces. As a result of its coherence, rock can form cliff or can be carved into sculptures. A pile of unattached mineral grains does not constitute a rock. Naturally occurring: Geologists consider only naturally occurring materials to be rocks, so manufactured materials, such as concrete and brick, do not qualify. An aggregate of minerals or a mass of glass: The vast majority of rocks consist of an aggregate (a collection) of many mineral grains, and/or crystals, stuck or grown together. Some rocks contain only one kind of mineral, whereas others contain several different kinds. A few rock types consist of glass. Mystery and romance follow famous gems. Consider the stone now known as the Hope Diamond, recognized by name the world over (figure above). No one knows who ﬁrst dug it out of the ground (See Where Do Diamonds Come From?). Was it mined in the 1600s, or was it stolen off an ancient religious monument? What we do know is that in the 1600s, a French trader named Jean Baptiste Tavernier obtained a large (112.5 carats, where 1 carat 200 milligrams), rare blue diamond in India, perhaps from a Hindu statue, and carried it back to France. King Louis XIV bought the diamond and had it fashioned into a jewel of 68 carats. This jewel vanished in 1762 during a burglary. Perhaps it was lost forever perhaps not. 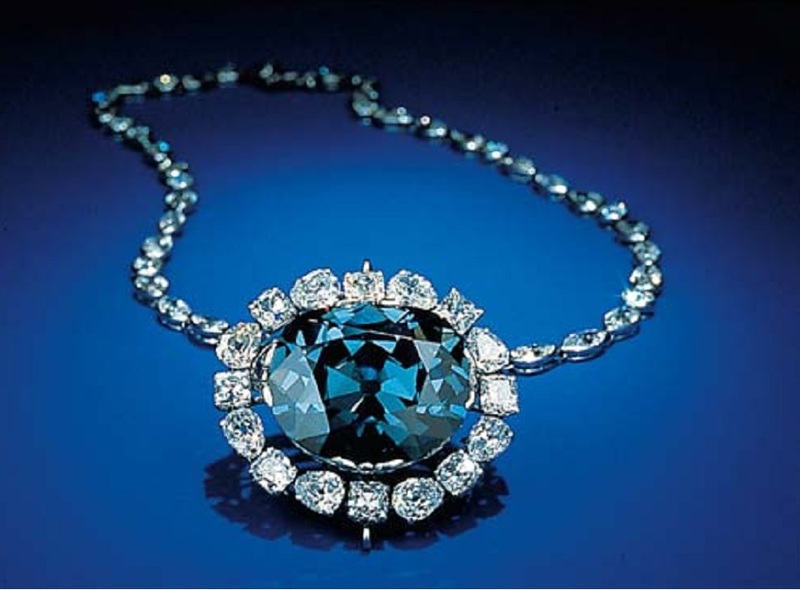 In 1830, a 44.5-carat blue diamond mysteriously appeared on the jewel market for sale. The 4,000 known minerals can be separated into a small number of groups, or mineral classes. You may think, “Why bother?” Classiﬁcation schemes are useful because they help organize information and streamline discussion. Biologists, for example, classify animals into groups based on how they feed their young and on the architecture of their skeletons, and botanists classify plants according to the way they reproduce and by the shape of their leaves. In the case of minerals, a good means of classiﬁcation eluded researchers until it became possible to determine the chemical makeup of minerals. A Swedish chemist, Baron Jöns Jacob Berzelius (1779–1848), analyzed minerals and noted chemical similarities among many of them. Berzelius, along with his students, established that most minerals can be classiﬁed by specifying the principal anion (negative ion) or anionic group (negative molecule) within the mineral. We now take a look at principal mineral classes, focusing especially on silicates, the class that constitutes most of the rock in the Earth. Amateur and professional mineralogists get a kick out of recognizing minerals. They might hover around a display case in a museum and name specimens without bothering to look at the labels. How do they do it? The trick lies in learning to recognize the basic physical properties (visual and material characteristics) that distinguish one mineral from another. Some physical properties, such as shape and colour, can be seen from a distance. Others, such as hardness and magnetization, can be determined only by handling the specimen or by performing an identiﬁcation test on it. Identiﬁcation tests include scratching the mineral by another object, placing it near a magnet, weighing it, tasting it, or placing a drop of acid on it. Let’s examine some of the physical properties most commonly used in basic mineral identiﬁcation. The word crystal brings to mind sparkling chandeliers, elegant wine goblets, and shiny jewels. But, as is the case with the word mineral, geologists have a more precise deﬁnition. A crystal is a single, continuous (that is, uninterrupted) piece of a crystalline solid, typically bounded by ﬂat surfaces, called crystal faces, that grow naturally as the mineral forms. The word comes from the Greek krystallos, meaning ice. Many crystals have beautiful shapes that look like they belong in the pages of a geometry book. The angle between two adjacent crystal faces of one specimen is identical to the angle between the corresponding faces of another specimen. For example, a perfectly formed quartz crystal looks like an obelisk (figure above a, b); the angle between the faces of the columnar part of a quartz crystal is always exactly 120°. This rule, discovered by one of the ﬁrst geologists, Nicolas Steno (1638– 1686) of Denmark, holds regardless of whether the whole crystal is big or small and regardless of whether all of the faces are the same size. Crystals come in a great variety of shapes, including cubes, trapezoids, pyramids, octahedrons, hexagonal columns, blades, needles, columns, and obelisks (figure above c). Solid: A solid is a state of matter that can maintain its shape indefinitely, and thus will not conform to the shape of its container. Liquids (such as oil or water) and gases (such as air) are not minerals (Some Basic Concepts from Chemistry). Deﬁnable chemical composition: This simply means that it is possible to write a chemical formula for a mineral (Some Basic Concepts from Chemistry). Some minerals contain only one element, but most are compounds of two or more elements. For example, diamond and graphite have the formula C, because they consist entirely of carbon. Quartz has the formula SiO2 it contains the elements silicon and oxygen in the proportion of one silicon atom for every two oxygen atoms. 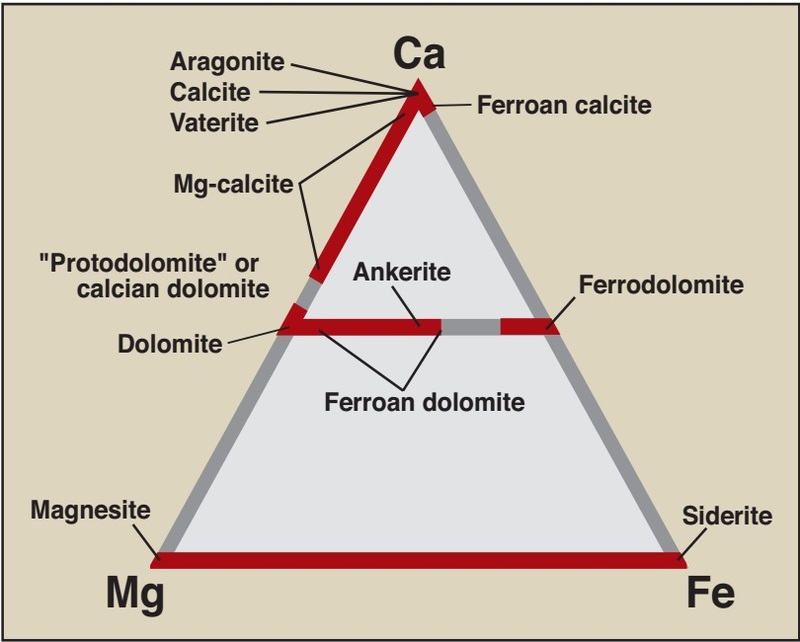 Calcite has the formula CaCO3, meaning it consists of a calcium (Ca ) ion and a carbonate (CO3 ) ion. Some formulas are more complicated: for example, the formula for biotite is K(Mg,Fe)3(AlSi3O10)(OH)2.
is an organic chemical. Almost all minerals are inorganic. Thus, sugar and protein are not minerals. But, we have to add the qualifier “almost all” because mineralogists do consider about 30 organic substances formed by “the action of geologic processes on organic materials” to be minerals. Examples include the crystals that grow in ancient deposits of bat guano. What Drives Plate Motion, and How Fast Do Plates Move? 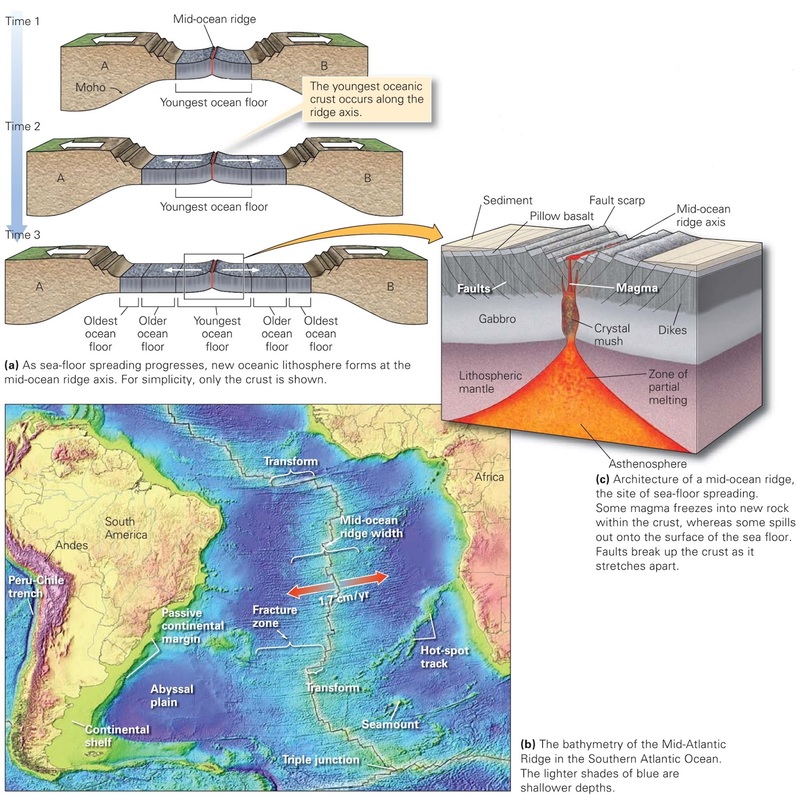 We've now discussed the many facets of plate tectonics theory but to complete the story, we need to address a major question: “What drives plate motion?” When geoscientists ﬁrst proposed plate tectonics, they thought the process occurred simply because convective ﬂow in the asthenosphere actively dragged plates along, as if the plates were simply rafts on a ﬂowing river. Thus, early images depicting plate motion showed simple convection cells elliptical ﬂow paths in the asthenosphere. At ﬁrst glance, this hypothesis looked pretty good. 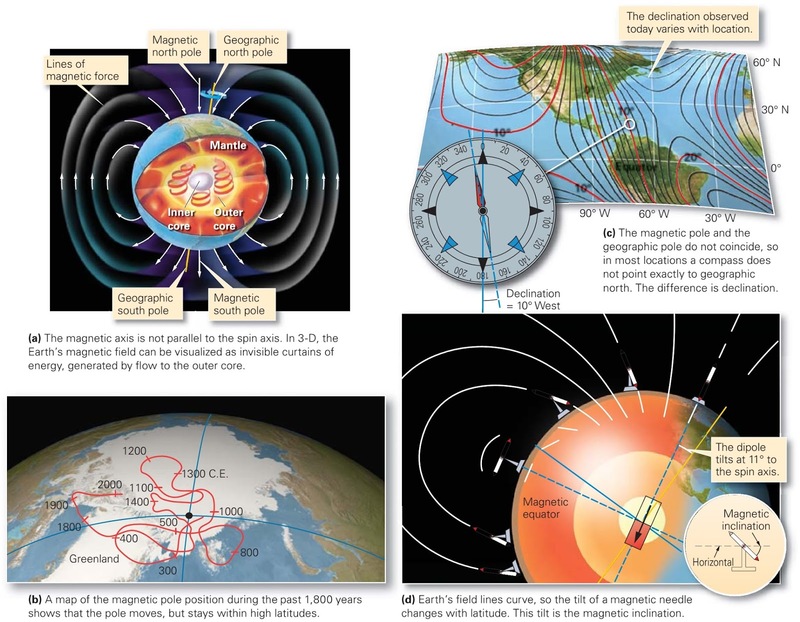 But, on closer examination it became clear that a model of simple convection cells carrying plates on their backs can’t explain the complex geometry of plate boundaries and the great variety of plate motions that we observe on the Earth. Researchers now prefer a model in which convection, ridge push, and slab pull all contribute to driving plates. Let’s look at each of these phenomena in turn. 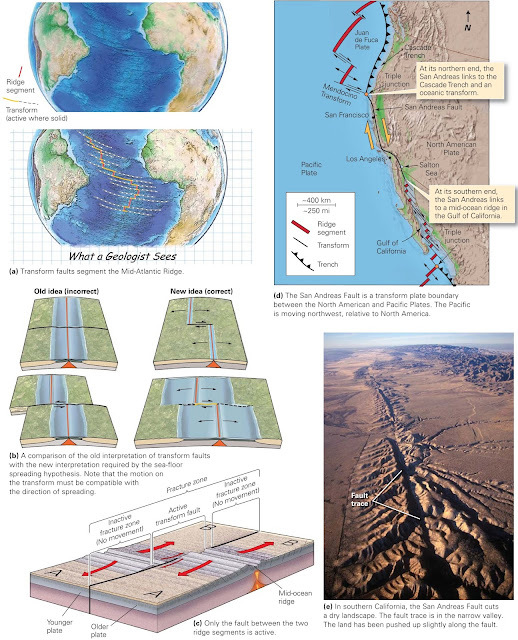 The conﬁguration of plates and plate boundaries visible on our planet today has not existed for all of geologic history, and will not exist indeﬁnitely into the future. 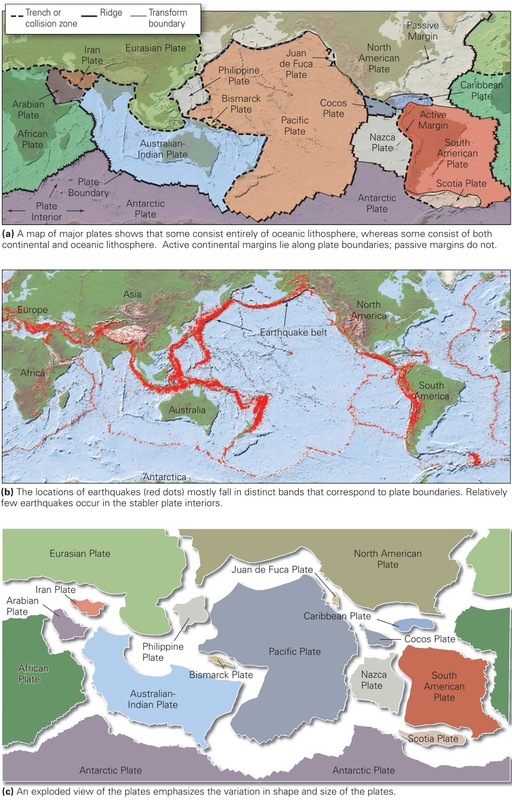 Because of plate motion, oceanic plates form and are later consumed, while continents merge and later split apart. How does a new divergent boundary come into existence, and how does an existing convergent boundary eventually cease to exist? 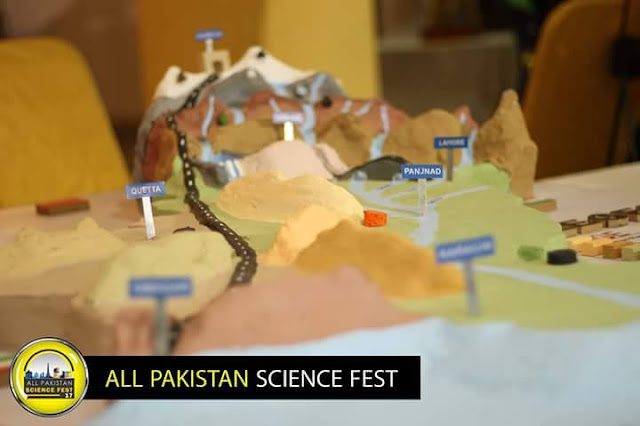 Most new divergent boundaries form when a continent splits and separates into two continents. We call this process rifting. 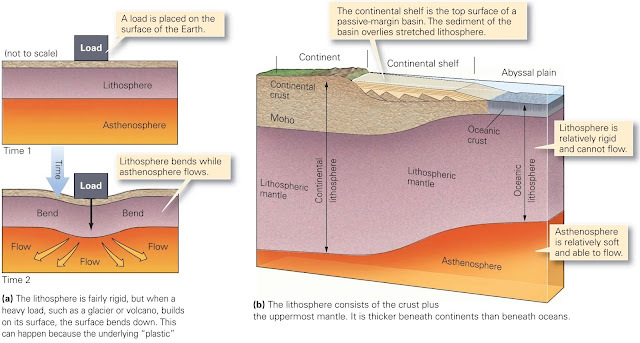 A convergent boundary ceases to exist when a piece of buoyant lithosphere, such as a continent or an island arc, moves into the subduction zone and, in effect, jams up the system. We call this process collision. Examples of triple junction. The triple junction are marked by dots. 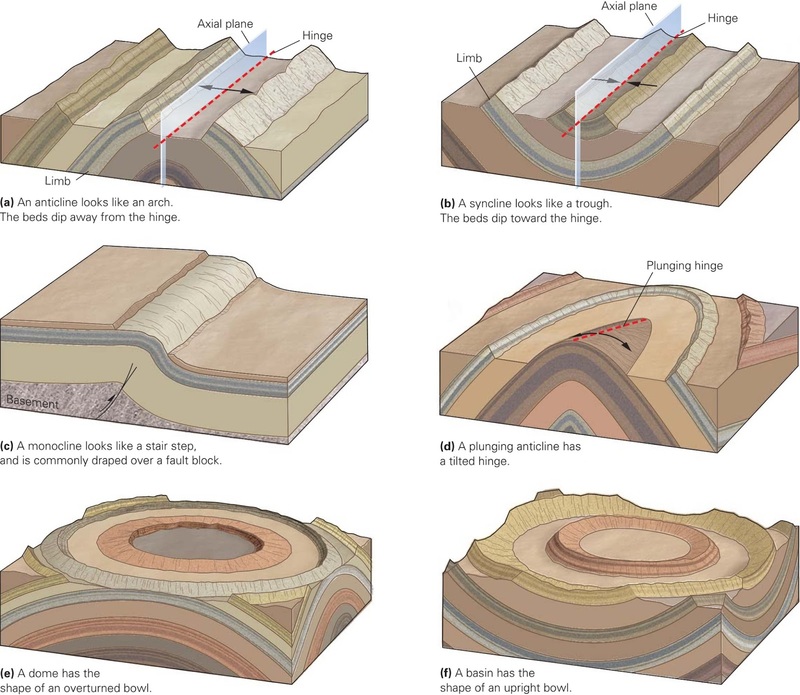 Geologists refer to a place where three plate boundaries intersect as a triple junction, and name them after the types of boundaries that intersect. For example, the triple junction formed where the Southwest Indian Ocean Ridge intersects two arms of the Mid–Indian Ocean Ridge (this is the triple junction of the African, Antarctic, and Australian Plates) is a ridge-ridge-ridge triple junction (figure above a). The triple junction north of San Francisco is a trench-transform-transform triple junction (figure above b). The dots represent the locations of selected hot-spot volcanoes. The red lines represent hot-spot tracks. The most recent volcano (dot) is at one end of this track. Some of these volcanoes are extinct, indicating that the mantle plume no longer exists. Some hot spots are fairly recent and do not have tracks. Dashed tracks were broken by sea-floor spreading. Most subaerial (above sea level) volcanoes are situated in the volcanic arcs that border trenches. Volcanoes also lie along mid-ocean ridges, but ocean water hides most of them. 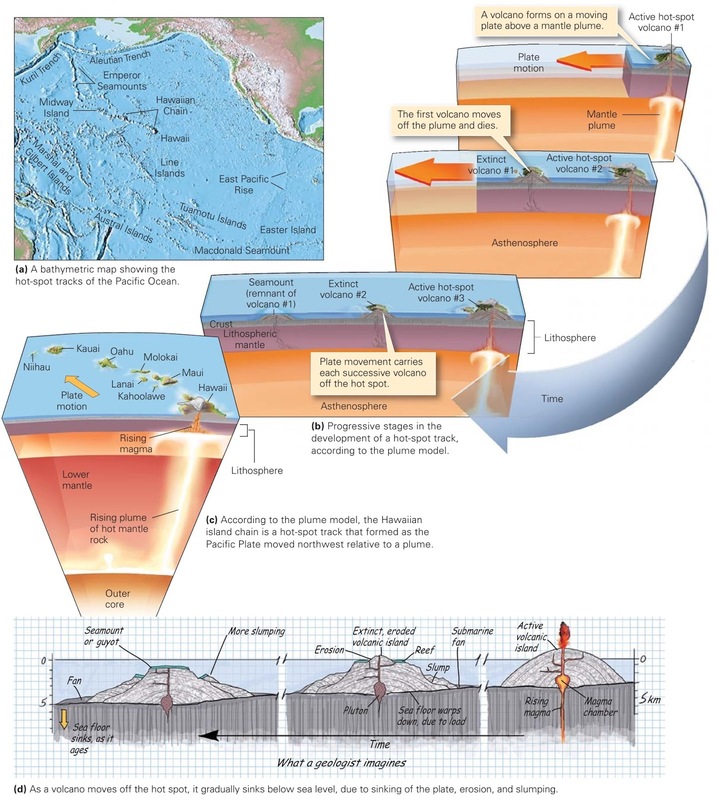 The volcanoes of volcanic arcs and mid-ocean ridges are plate boundary volcanoes, in that they formed as a consequence of movement along the boundary. Not all volcanoes on Earth are plate-boundary volcanoes, however. Worldwide, geoscientists have identiﬁed about 100 volcanoes that exist as isolated points and are not a consequence of movement at a plate boundary. These are called hotspot volcanoes, or simply hot spots (figure above). Most hot spots are located in the interiors of plates, away from the boundaries, but a few lie along mid-ocean ridges. What causes hot-spot volcanoes? In the early 1960s, J. Tuzo Wilson noted that active hot-spot volcanoes (examples that are erupting or may erupt in the future) occur at the end of a chain of dead volcanic islands and seamounts (formerly active volcanoes that will never erupt again). This conﬁguration is different from that of volcanic arcs along convergent plate boundaries at volcanic arcs, all of the volcanoes are active. With this image in mind, Wilson suggested that the position of the heat source causing a hotspot volcano is ﬁxed, relative to the moving plate. In Wilson’s model, the active volcano represents the present-day location of the heat source, whereas the chain of dead volcanic islands represents locations on the plate that were once over the heat source but progressively moved off. The deep mantle plume hypothesis for the formation of hot-spot tracks. A few years later, researchers suggested that the heat source for hot spots is a mantle plume, a column of very hot rock rising up through the mantle to the base of the lithosphere (figure above a–d). In this model, plumes originate deep in the mantle. Rock in the plume, though solid, is soft enough to ﬂow, and rises buoyantly because it is less dense than surrounding cooler rock. 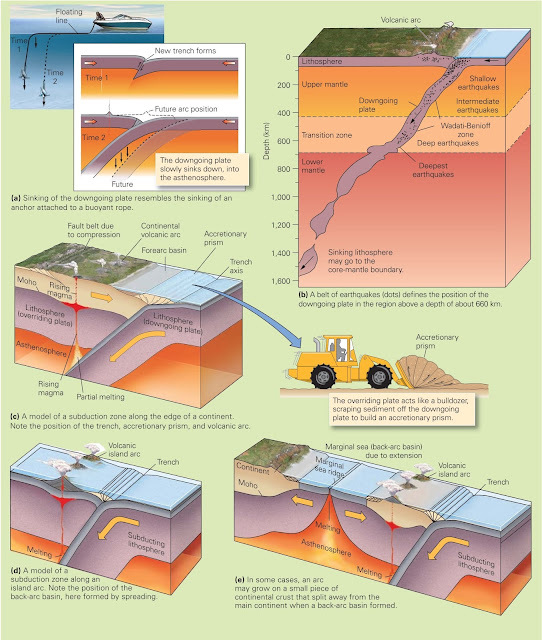 When the hot rock of the plume reaches the base of the lithosphere, it partially melts and produces magma that seeps up through the lithosphere to the Earth’s surface. The chain of extinct volcanoes, or hot-spot track, forms when the overlying plate moves over a ﬁxed plume. This movement slowly carries the volcano off the top of the plume, so that it becomes extinct. A new, younger volcano grows over the plume. The Hawaiian chain provides an example of the volcanism associated with a hot-spot track. Volcanic eruptions occur today only on the big island of Hawaii. Other islands to the northwest are remnants of dead volcanoes, the oldest of which is Kauai. To the northwest of Kauai, still older volcanic remnants are found. About 1,750 km northwest of Midway Island, the track bends in a more northerly direction, and the volcanic remnants no longer poke above sea level; we refer to this northerly trending segment as the Emperor seamount chain. 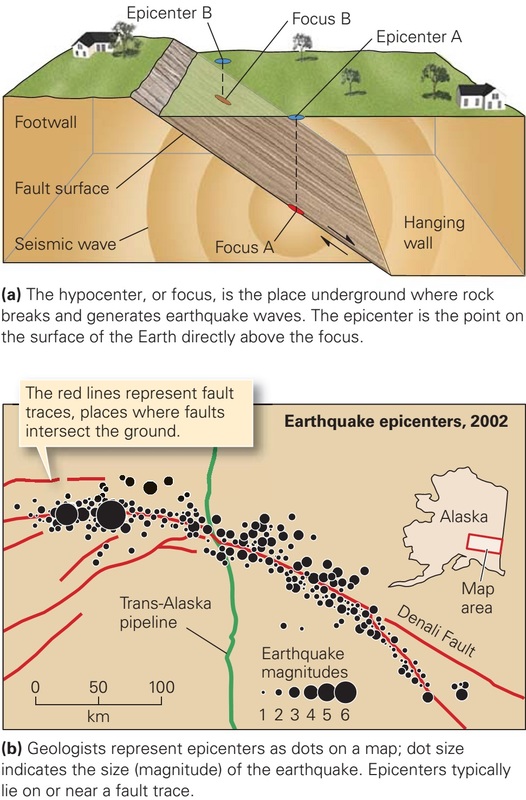 Geologists suggest that the bend is due to a change in the direction of Paciﬁc Plate motion at about 40 Ma. Some hot spots lie within continents. For example, several have been active in the interior of Africa, and one now underlies Yellowstone National Park. The famous geysers (natural steam and hot-water fountains) of Yellowstone exist because hot magma, formed above the Yellowstone hot spot, lies not far below the surface of the park. While most hot spots, such as Hawaii and Yellowstone, occur in the interior of plates, away from plate boundaries, a few are positioned at points on mid-ocean ridges. The additional magma production associated with such hot spots causes a portion of the ridge to grow into a mound that can rise signiﬁcantly above normal ridgeaxis depths and protrude above the sea surface. Iceland, for example, is the product of hot-spot volcanism on the axis of the Mid-Atlantic Ridge.